If you have attended PGC before, you understand the feeling of leaving PGC and feeling so passionate about the wealth of information you gained. You have special memories of what it was like to play in a gym full of SCHAPE‘d athletes, and you are pondering just how special it could be for your team at home to give you that same feeling. With your new leadership skills, you are more than ready to take on the role of SCHAPE’ing your team. However, you are also aware there are some ideas from PGC that will be difficult to implement without the support of your coach. You ask yourself, “My coach was not at PGC, so how is he/she going to be able to help my team and me practice PGC habits? If s/he doesn’t know everything I learned, how is he/she going to hold us accountable?” You head home and have the urge to march into your coach’s office and spill all of the information you just learned. I had those exact same feelings too. Before entering the office, let’s take a step back and analyze the situation to ensure you will receive the results you desire. For starters, it is important to remember that coaches are also a wealth of information. They too have spent time of their own improving their knowledge of the game, reading books, and attending camps. They are not expecting one of their players will come to their office and share hours and hours of information about how they should run their team and conduct practice. Don’t get me wrong, good coaches are open-minded and most would say they would love to hear about what you learned. BUT how you present the information is of great importance. In addition, you may have learned some concepts that contradict what your coaches teach back home. What did you learn about this situation at PGC? YOUR COACH IS ALWAYS RIGHT! These concepts are not the ones that you should feel the urge to discuss with your coach. Don’t waste your time and energy trying to change your coach’s philosophy – just focus on the PGC concepts that may be new to your coach and do not challenge his/her own ideas. ASK your coach if s/he is interested in hearing about your experience and learning some new information. Don’t just assume that they are. Once your coach has agreed to meeting with you, differentiate between what your coach does and does not need to know from your notes. For example, your coach does not need to know what a “sheep-dog mentality” is for you to bring that to practice every day . 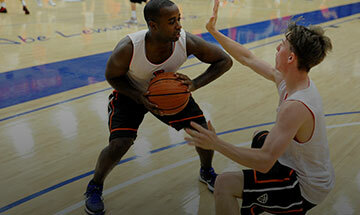 Many PGC concepts will shine through you just by your change in behavior. However, your coach does need to know what the “shot selection scale” is all about if you are going to urge your teammates to find “7s, 8s, and 9s”. See the difference? Choose a few key ideas to start with. You don’t want to overstep your boundaries and share too much at one time. Pick a concept that you think will have the greatest impact on your team and start with that. You can always meet with your coach again and share something new in the future. Trust your coach. If they don’t implement your new information right away, that’s ok. If they don’t ever implement your information, that’s ok too. The most important thing is you gave your coach the knowledge and the opportunity to use it. The rest is up to them. Continue working hard and control the controllable. Now that you’ve done your part and given your coach an opportunity to use PGC information, put your focus and energy towards implementing the concepts and principles from PGC that you can control. Jaqui Kalin (Northern Iowa) is a five (5) time graduate of PGC Basketball having attend Think The Game, Essentials, Advanced Concepts and the College/Pro session twice. She’s in the process of completing the final requirements to earn her PGC degree. Kalin was recently announced as a 2010-2011 Academic All-American and MVC Athlete of the Week after averaging 24pts/game and going 12-for-12 from the free throw line. Kalin leads UNI with 15.3 points per game, and she ranks eighth nationally with a 2.4 assist-to-turnover ratio. The Sioux City, Iowa native graduated in 3.5 years with a degree in exercise science and a 4.0 grade point average. She is currently pursuing a master’s degree in kinesiology.